I would like to add some soft corals or Gorgonian corals to my Seahorse tank. My main concern is the temperature. The tank stays around 71F, so I am wondering what corals people are keeping with their Seahorses that can tolerate low temperatures? I have Leather and Xenia corals along with three different types of Photosynthetic Gorgonian in my reefs tanks. Anybody keeping these with their Seahorses at this temperature? Four legs good. Two legs better. Yes, I am having good luck with all those coral. My tank is set for 70-72 degrees but even goes to 68-69 at night. About the only coral that isn't doing well is a green slimer but perhaps the tank is too dirty for its liking, but even it is not dead. Nice looking tank! Thanks for the photo. 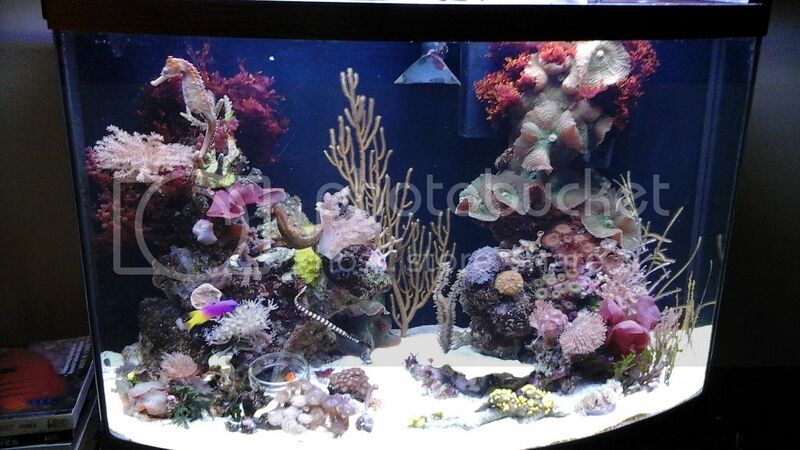 Not including the Mushrooms, I have the same corals in my other tanks. Now that I know it is possible I will start slowly moving corals into the Seahorse tank. I did acclimate them slowly. Many montis will handle lower temps better than most SPS type corals. Thanks for the advice, I think after the holidays I will start importing the corals. Hey guys, hoping to get seahorses in the next 6 months and was wondering if there were any recommended corals that will provide hitching posts. I have a redsea reefer 250 (65 gallon) with 2 ai primes and my tank is turned over 10 times an hour. Last edited by extendedmango; 01/11/2016 at 08:20 PM. That is about what my tank turns over, maybe just a little more. Even with that much turn over I still have small rio powerheads to keep food and detritus up off the sand so it can be dealt with in the sump. My seahorses like a colt coral, (which I think is really funny) I have. They also like gorgonian and macro algae. What species of seahorses are you keeping at 71 degrees? Unless they are temperate species most will be ok a little warmer. i kept my H. erectus at 72-74 degrees with great success. In the summer the temps were even higher and I was able to raise them through 6 generations. They are H. Erectus. Tank is staying 71.5-72.5. They seem happy like this. [QUOTE=vlangel;24246631]That is about what my tank turns over, maybe just a little more. Even with that much turn over I still have small rio powerheads to keep food and detritus up off the sand so it can be dealt with in the sump. Do you think a devils finger coral would work well for them or is it too thick to hitch to? I kind of think they could hitch to a devils finger but not sure. It is worth a try. you should not keep seahorses in the tank with all the other fish you have. Seahorses should be in a species-only tank. clown, blenny, and melanurus wrasse will eat all the food you put in there before the seahorses get any. You can use http://www.seahorse.org/library/arti...ankmates.shtml as a general guide for tankmates. Sometimes exceptions work out and other times they don't. Personally I've not had luck with other fish in with my seahorses, but a lot of other people have, even with some fish not recommended. I haven't heard anything specific to that species, but the threat levels for the wrasses shown run from 2 to 4 but I would think the melanerous being fairly timid would be at the low end. You might have to post that query on the "org" where there are a greater number of people viewing that may give a better chance of an answer.